Can I get a prescription for Famvir online? 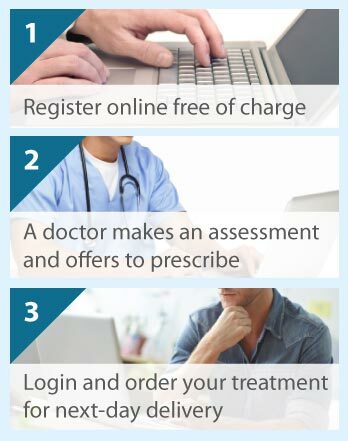 The Online Clinic can prescribe Famvir after you complete a short online consultation form. We can guarantee next day delivery in the UK. Famvir (famciclovir) is an antiviral agent used to treat a range of viral infections caused by the different herpes viruses. The Online Clinic will generally only prescribe Famvir for genital herpes to help relieve the symptoms and aid the recovery. How does Famvir (famciclovir) work? Famvir acts by slowing down the replication and therefore spread of the virus inside the body. Specifically, it interferes with the replication of viral DNA essential for its survival. How is Famvir (famciclovir) used to treat herpes virus infection? Famvir is available as an oral tablet (125, 250, and 500 mg) and can be taken with liquid and with or without food. Different doses given at varying frequencies over varying course lengths are used to treat the different herpes virus infections. The dose will be dependent on whether your outbreak is primary or secondary. Are there any side effects of Famvir (famciclovir)? The most common side effects of Famvir are headache, nausea and disorientation. Other less common side effects include, vomiting, dizziness, drowsiness, and skin inflammation. Most people do not get any side effects whatsoever. Can anyone use Famvir (famciclovir)? Famvir should be used with caution if you suffer from renal or liver problems. Famvir should not be given to children and should not be used if you have severe lactose intolerance or are allergic to penciclovir. If you complete our consultation form then we can determine if this is an appropriate medication for you.